For agrarian societies, access and ownership of land plays a key role in the production process in developing countries like Uganda where rural livelihoods depend almost entirely on farming (ag-ricultural produce) derived from the land. Many academics and women activists have stressed the importance of equitable land distribution between men and women as a way to promote produc-tion. This is partly because ensuring the protection of women’s land rights has enabled even the most vulnerable rural women, widows and those with orphans, to derive a more secure liveli-hood from farming. This study selected the case of Busia District in Eastern Uganda, an area where women’s land rights have not yet been given much attention in practice. 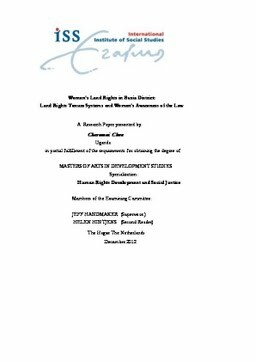 This study focus-es on women’s awareness in Busia District on how the existing legal and institutional frame-works can be supportive to the women’s access to land rights. The study explored the level of knowledge of rural women about their existing land rights and actions being taken to help over-come obstacles that limit their access and ownership to land. Findings revealed that the majority of respondents (around 60%) had experienced land disputes involving gender issues, and that about 90% were aware of the existence of women’s land rights as codified and legislated by the law. The study also found that local council courts and district land boards were important when it came to settling land disputes in Busia district. Finally, the study found that women’s fight to protect and claim their land rights have generally been effective (in three quarters of all cases). However women’s struggles for equal access and ownership to land rights are being affected by corruption, which is prevalent within the judicial system. Furthermore, their struggle to exercise and realize their right to land is also exacerbated by the high level of women’s poverty. The study concluded that there is a need for women to have more interest in their own land rights, and that this should involve specific ownership and user rights, as well as improved customary access to land. Specific measures from various institutions may be needed to help ensure that awareness can lead to more equal participation of women in decision-making, in the struggle for greater equality in land rights.